We have available 5 images from the 1010 silkscreens from the Africa Suite, 1970. Robert Motherwell was one of the leading Abstract Expressionist painters from the New York School. As an action painter he applied the concept of automatism (the automatic action allowing unconscious ideas and feelings to be expressed. In 1970 Robert Motherwell made 11 drawings for the Africa Suite. 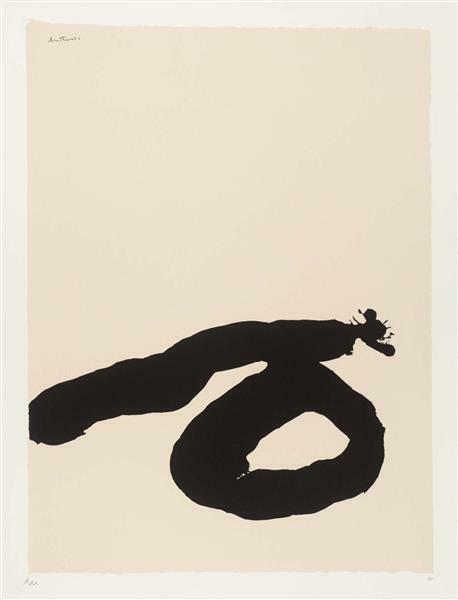 These are bold ink on paper gestures with white acrylic overpainting and white paper masking done in Robert Motherwell&rsquo;s iconic black and white palette. In order to determine the final size of the silkscreens Motherwell adhered the drawings onto a base sheet. The 10 resulting silkscreens that comprise the Africa Suite are large in format (40 3/4 x 28 1/4 inches). Printmaking was a major medium for Motherwell and this project represents the first time the artist worked with silkscreening.